The importance of wearing the right gear while riding a bike can’t be overstated. Trouble is, there’s so much to choose from, with such a wide range of styles and materials – not to mention prices – that knowing where to start when buying kit can be more than a little confusing. The main reason to get properly kitted out is for protection in the hopefully unlikely event of an accident. But it’s not just cash protection; you need to think weather protection too. Being cold and wet is not only downright unpleasant but it also saps your concentration and puts you more at risk of making a mistake. So here’s our guide to getting kitted out with the essentials for safe and comfortable riding. A helmet is the only piece of riding kit you’re obliged to wear by law, and as a result they have to conform to certain regulations. All helmets sold in the UK are built to the ECE 22.05 European standard, and there’s also something called the Safety Helmet Assessment and Rating Programme (SHARP), which conducts further impact tests on helmets and rates them according to the results. 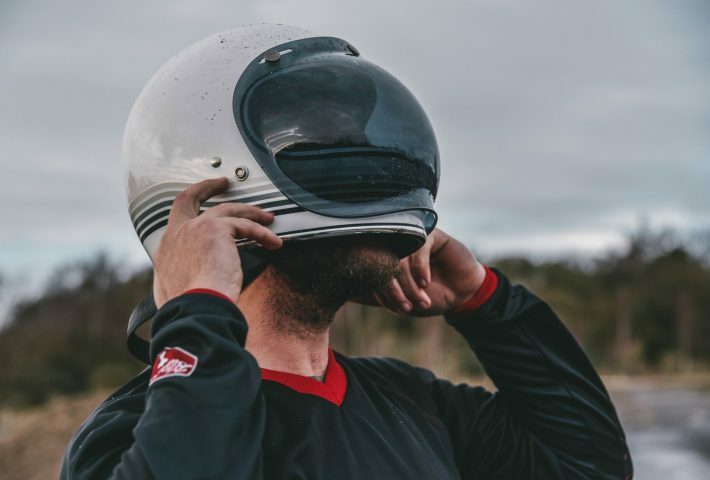 Which motorcycle helmet is best? Helmets come in variety of types and styles, including open face, full face, flip-up and off-road/adventure. The main outer shell will be made from polycarbonate, glassfibre or a composite mix of glassfibre, carbonfibre and/or Kevlar. Polycarbonate was long seen as second-best, but these days that’s not necessarily the case. All will be ECE 22.05 approved, although pricier composite helmets tend to weigh quite a bit less. Well specified full-face polycarbonate helmets with features such as adjustable ventilation, a quick-release visor and removable, washable lining are available from around £100, but you can pay well in excess of £800 for a composite race-spec helmet. No matter what you spend and which style you choose, the most important thing is that the helmet fits you properly. It should be snug on your head without any uncomfortable pressure points and resistant to any twisting or tilting when the strap is fastened. It might be necessary to try helmets from a few different manufacturers before you find one that suits your head shape, so be prepared to shop around. Helmet makers always try to minimise the amount of wind noise inside a helmet. If you’re going to cover a lot of miles you want the quietest helmet possible, although you’re probably better off with earplugs, too. Of all the kit you can buy, jackets perhaps offer the widest range of styles, materials, specifications and features. Textile, leather, casual, retro-look, waxed cotton, breathable waterproof membranes, body armour, removable thermal linings, race styling and rugged off-road looks are all available in all manner of combinations. If you really push the boat out you can spend around £1000 on a top-spec fully armoured textile jacket. But a stylish, well-specified jacket with a waterproof membrane and shoulder and elbow armour with CE approval (meaning it conforms to a recognised minimum standard for personal protective equipment) can be bought from around £150. 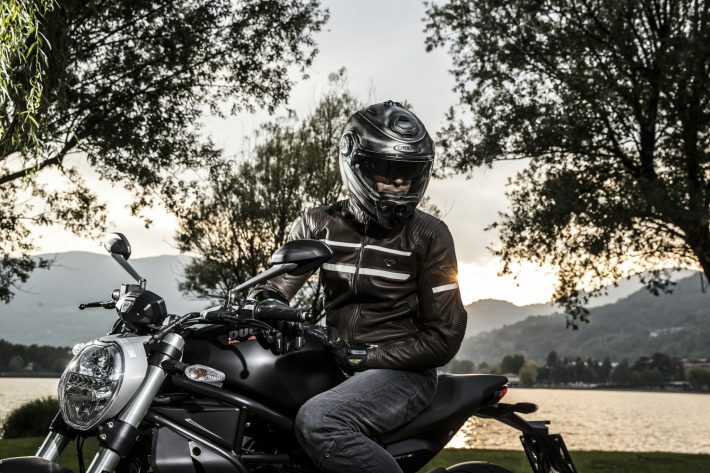 Leather offers more crash protection but is less effective at keeping the elements out, although that could be addressed with a light, unlined waterproof jacket over the top. Again, leather jackets come in a wide range of styles, and prices start from under £200. Fit is important. Too snug and it will feel restrictive and the sleeves might ride up at speed, but too loose and draughts and rain will find their way in. Try on as many different jackets as you can and think about the type of riding you’re going to be doing. Finding something within your budget shouldn’t be too difficult. Your hands can take a hammering on a bike, especially when it’s cold and wet. Many gloves claim to be waterproof but they all let water in eventually, either through the seams or by it seeping in from the cuffs. If you’re going to be riding in all weathers you’ll probably end up needing more than one pair: what works in winter will be simply too hot in the summer. Plain black gloves proliferate and leather remains the most popular material, although leather/textile combinations are common. 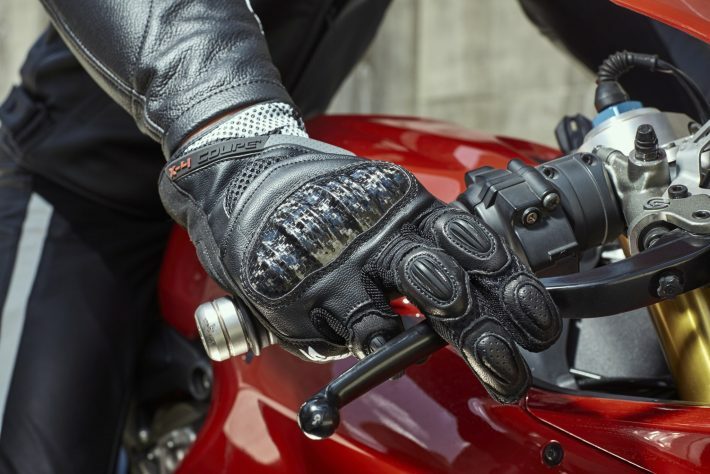 There are a variety of styles, though, from the longer, almost gauntlet-style winter gloves to the ‘shorty’ summer gloves that stop at the wrist. Many riders prefer a longer cut than that, however, with sporty unlined gloves remaining the default choice for a lot of riders in hot weather. A decent pair of lined, waterproof gloves can cost from around £60, with some shorter-cut summer gloves costing even less, although you can pay well in excess of £200 for a top-spec winter glove, and considerably more than that for a top-of-the range fully armoured race glove. 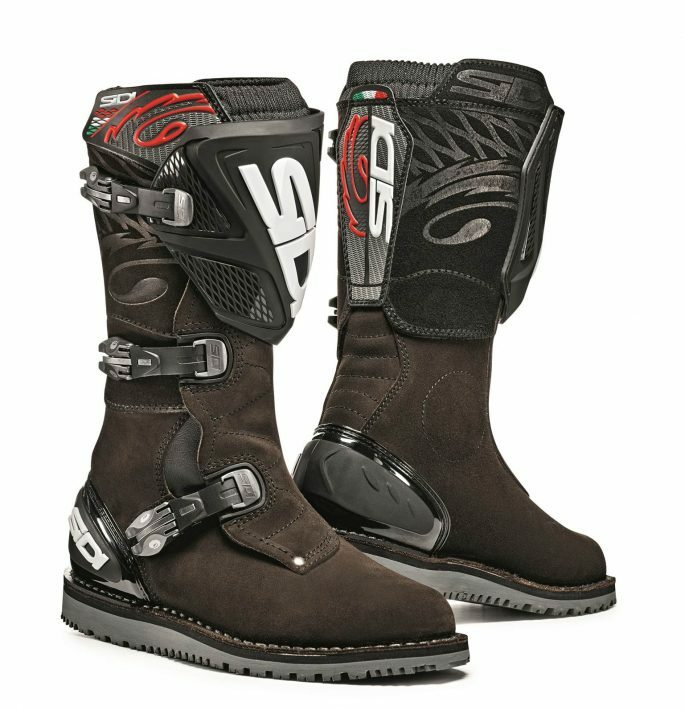 Once again, a variety of styles proliferate, from the traditional black sport/touring motorcycle boot to colourful race boots, motocross style adventure boots and traditional retro-look lace-up biker boots. Leather is by far the most common material, although some boots are made using a leather-like synthetic such as Lorica. Features include shin and ankle protection, toe sliders and waterproof but breathable linings, while some higher-spec race boots incorporate skeleton-like impact-resistant plastic or Kevlar articulations that help prevent injuries, either fixed externally or even, in some cases, as a separate inner boot. In recent years there has been a growth in the market for casual and retro-look lace-up biker boots, which offer much of the protection of conventional bike boots while not looking – or feeling – out of place off the bike. Prices vary considerably. A traditional sports/touring boot can cost from under £100, while a decent pair of casual/vintage/retro lace-ups will cost between £150 and £200. At the top end of the market, a fully armoured leather/composite boot-within-a-boot for race use will cost from £400 to £1300. In the rush to get kitted out, the importance of a decent pair of riding trousers is often overlooked. It shouldn’t be: your legs, and particularly your knees, are vulnerable on a bike, both through accidents and in cold and wet weather. Fortunately, a decent pair of biking trousers shouldn’t cost the earth. Waterproof, armoured textile trousers cost from around £60 and can often be bought in tandem with a matching jacket, to which the trousers will zip for added security and weather protection. As with jackets, of course, you can spend considerably more than that if you choose, with a range-topping pair of trousers from one of the big brands costing in excess of £800. Leather is, of course, an option too, and once again, trousers can often be paired with – and zipped to – matching jackets. Expect to pay anything from around £130 to £400 or more for leather trousers. Alternatively, there’s now a wide range of armoured riding jeans on the market. These look like regular denim jeans but feature a more rugged construction incorporating hidden seams, reinforced panels and even the provision for knee and hip armour. The advantage is that they can be worn off the bike like casual jeans, but the disadvantage is that, despite their protective elements, they’re not going to provide the protection of a pair of leather or even textile riding trousers. Even so, they are extremely popular. Look to pay upwards from £150 for a decent pair. One-piece or race leathers tend not to be the first choice of kit for new riders. 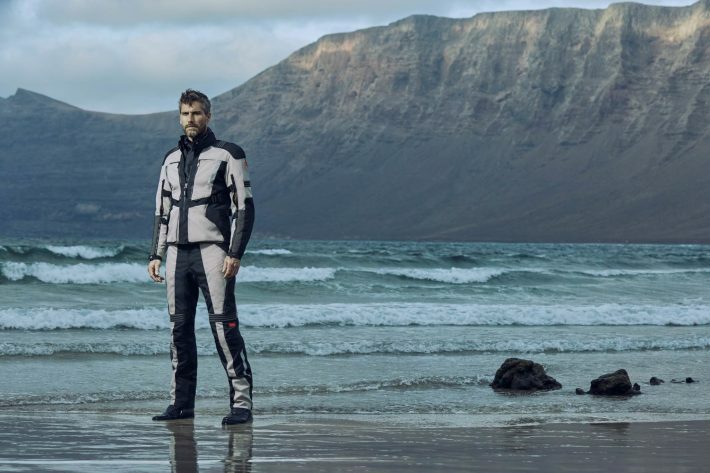 They’re not exactly practical off the bike, they don’t offer a great deal of weather protection (so they need supplementing with oversuits and the like) and not everyone wants to look like they’re heading off for a MotoGP qualifying session every time they step out of the front door. 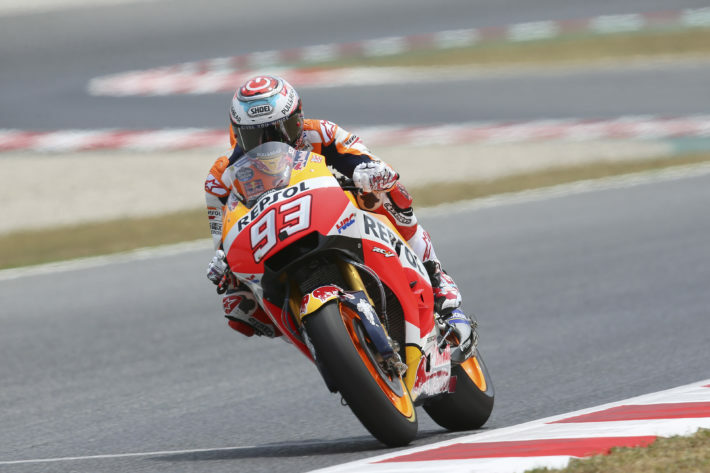 What a properly fitting, well-specified race suit does offer, however, is unparalleled protection in the event of a crash, and the feeling of security you get from wearing one is unsurpassed. 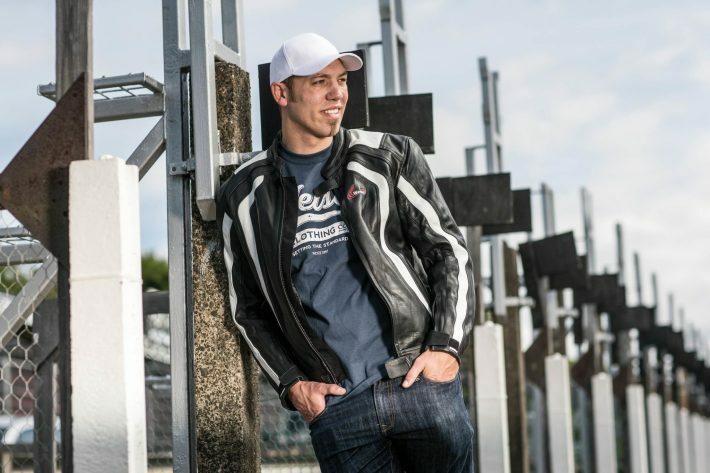 As a result, many more experienced bikers have a one-piece suit as part of a wider range of riding kit, especially if they ride sports bikes and/or regularly do track days. Expect to pay anything from £350 or so to upwards of £2000 for quality, off-the-peg one-piece leather suit. And don’t forget the knee sliders. Visit a big bike shop with a large clothing section, or browse a few websites, and the amount of accessories and extra kit that’s available is almost as confusing as it is endless. So how much of it is really necessary and what should you consider buying? It all depends on the kind of riding you’ll be doing – daily commuting, touring, weekend fun – and what kind of weather you’ll be riding in. You’ll manage with some – ideally most – of the main items of kit listed above, but we’d be inclined to supplement that with a few key extras. Neck warmer is a biker must-have! First on the list would be a decent neck warmer, sometimes known as a neck tube. They’re ideal for plugging the gap around your neck and stopping draughts getting inside your jacket, and they only cost a few pounds. There are all sorts of types made from all sorts of materials, so find something that works with your combination of jacket and helmet. Just make sure it doesn’t restrict your neck movement or cause undue visor misting when you’re wearing it. Another essential are earplugs. Even the quietest helmets produce wind noise at speed, and if you’re going to be doing a lot of miles you really should wear earplugs. Again, there are all sorts of styles and types, but the important thing is to find a pair that suit the shape of your ear canal and can be worn without discomfort. For year-round riding you might want to invest in some thermal tops and longjohns. Forget the thick woolen stuff your gran used to wear (and probably knitted herself); today’s thermals use thin, lightweight and body-hugging materials that won’t make you feel like the Michelin Man once you’ve put the rest of your kit on top. Expect to pay anything from £20 each for a long-sleeve top and a pair of longjohns. Many textile and leather jackets come with shoulder and elbow armour included, but it’s often the case that a back protector isn’t. We’d recommend getting one. Back protectors can feel a little cumbersome at first but the added protection they give in the event of an accident isn’t to be sniffed at. There are a few different types available, ranging from around £30 for a basic back protector up to £150 or more, but the most important thing is that it fits you properly and is held in place securely, so try a few on with your riding jacket before making a decision. Finally, an unlined one- or two-piece oversuit might be a good idea, especially if you’ve opted for leather riding gear over textile, or if you’ve chosen denim riding jeans. Unlined kit packs away very small and doesn’t cost the earth, but it offers little, if any, crash protection and it tends not to ‘breathe’, so you can get pretty sweaty underneath if you wear it in warm weather. Look to pay from £20 for a pair of trousers and upwards of £30 for a jacket, or from £40 or so for a one-piece oversuit.